DON'T HAVE TIME TO SELL ADS? Selling ads directly can be rewarding but it'll take you a lot of time to get set up. If you value your time, it may be better to sign up for an ad network and you won't need a media kit. 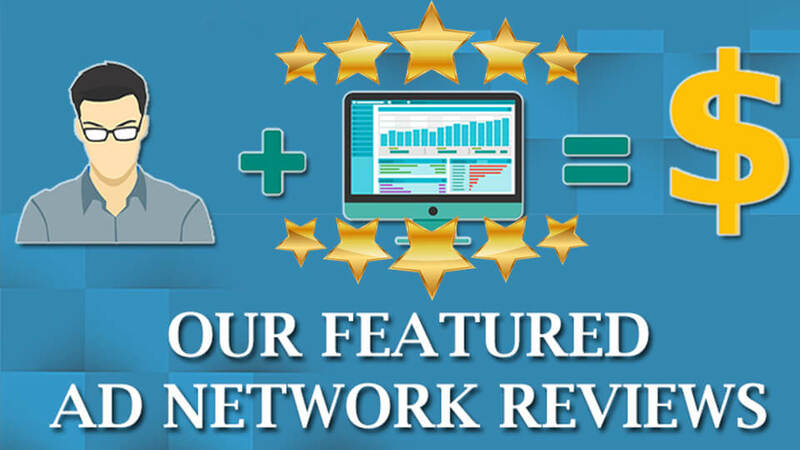 Click the button below to find the best ad network for you! If you’re looking to improve your display ad monetization by moving away from networks and starting to establish direct relationships, building a media kit is one of the most important and most challenging tasks you’ll take on. We recently put out our sample media kit template, which serves as a starting point for those looking to build a sales package for their blog or website. Today we’re highlighting several examples of well-done media kits that can serve as templates and inspiration for those about to tackle this task. This media kit gets straight to the point and efficiently communicates the unique opportunity on this site. 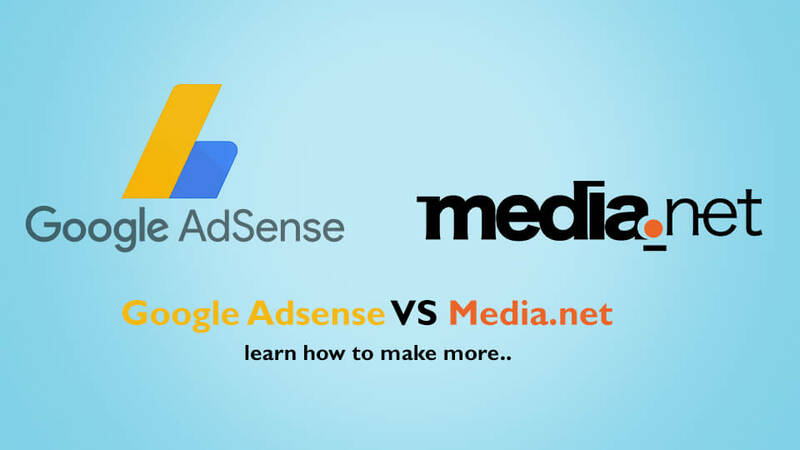 After viewing just a few pages a prospective media buyer has a clear idea of what the site contains, what makes the audience unique / valuable, and how exactly advertisers can get their message to that audience. Killer Page: The “Entrepreneur At A Glance” page offers a great template for audience statistics that can be applied to sites in just about any niche. This media kit is a bit dated, but still an excellent example for a niche site with unique sponsorship opportunities. 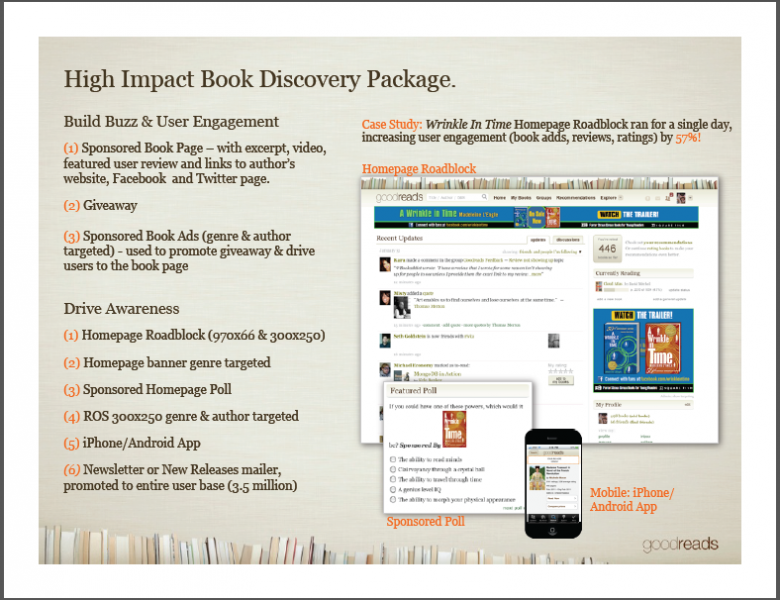 Killer Page: We love the section on the packages available, including the “Book Discovery Package.” The value proposition to advertisers is clearly articulated, showing off the unique marketing opportunities on this site. This media kit gives detailed information on the demographic, including an extremely helpful comparison of several other competitive sites. That makes life easy for media buyers on the lookout for new sites; it essentially does a big part of their job for them. 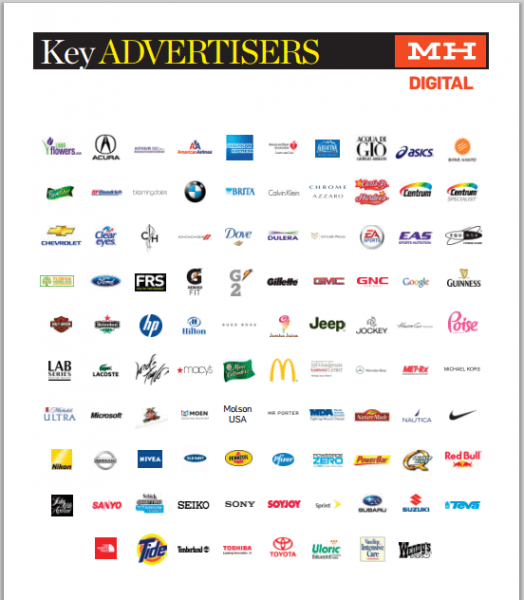 Killer Page: The “Key Advertisers” page is pretty powerful as well, graphically indicating the quality of the site by highlighting several well known brands that have been featured there. If you have an impressive list of past advertisers, this type of feature can be a great “social proof” for your media kit. 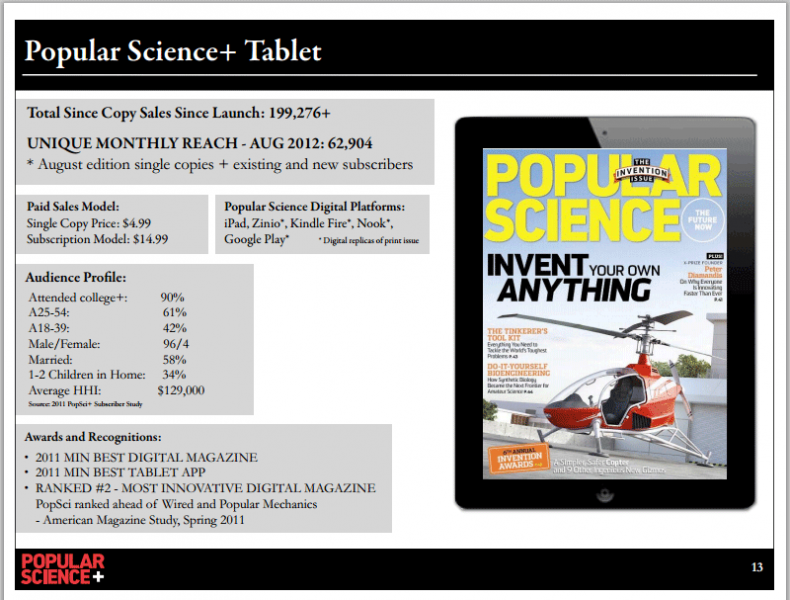 The Popular Science media kit is an example of a well done “kitchen sink” that includes a spec sheet and rate card along with the traditional components. The feature of the various channels gives a good understanding of what types of advertisers would be a good fit, and the demographic info is straight to the point. 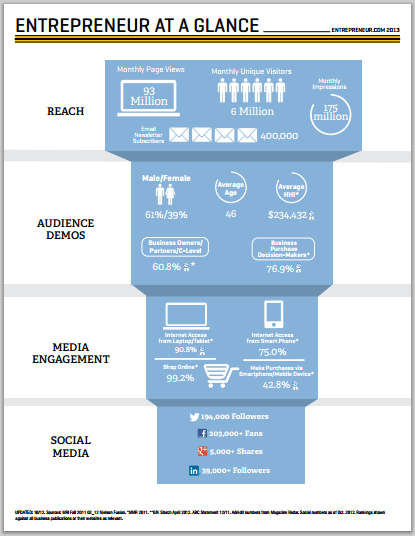 Killer Page: This media kit does a great job laying out opportunities to sponsor mobile devices and tablets. If your site has a big mobile presence and/or app sponsorships available, this makes for a good template. This media kit drives home the point early and often: this property caters to males, and can help advertisers get in front of the young male demographic. 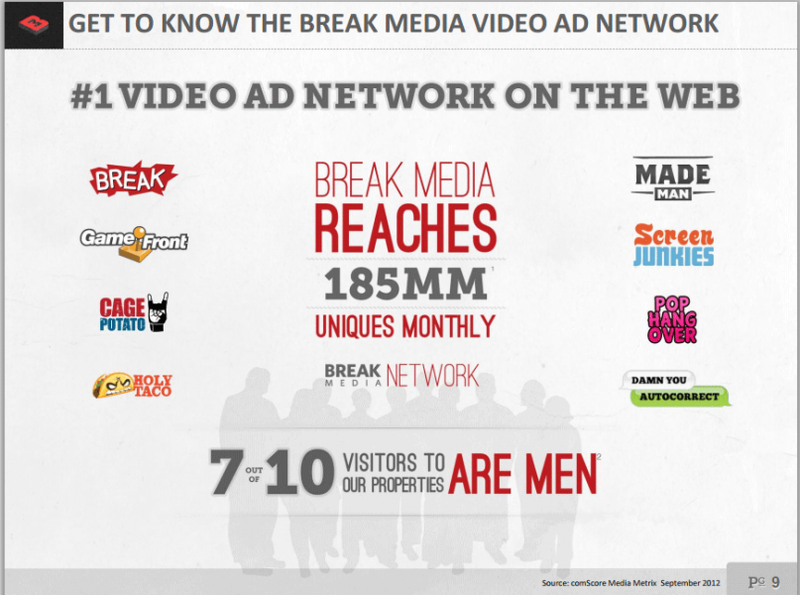 It essentially tells anyone interested in reaching an older or more female audience that this isn’t the place for them–and proceeds to highlight just how many young men are coming to Break.com and other properties in the network. Here’s the proof that a media kit doesn’t need to be lengthy to be effective. In just a few pages this media kit conveys the nature of its content, highlights a unique audience, and lets you know exactly what sponsorship opportunities are available. Short, sweet, and effective. Killer Page: Check out the “Ad Products” page; it’s a great example of how to show advertisers where their messaging can appear in a clean, precise way. Fast Company’s media kit includes the print publication, but still stands out as a great example of how to present your site to potential advertisers. 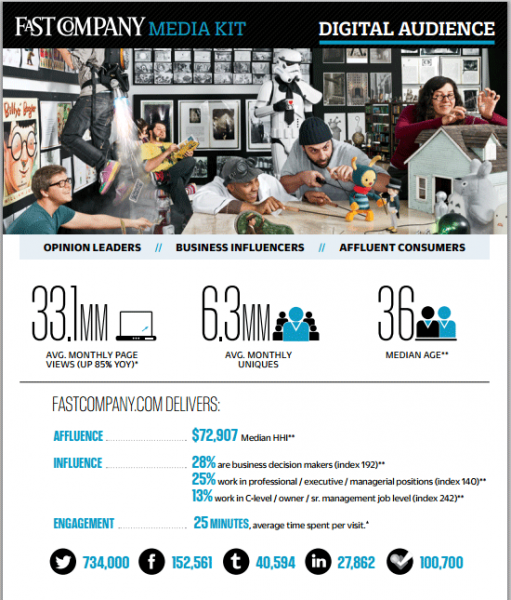 Killer Page: The “Digital Audience” page here is great; it succinctly explains that Fast Company can deliver affluence, influence, and engagement (along with statistics that back up each point). The 12 numbers on this page tell potential advertisers everything they need to know, and hammer home the point that Fast Company can offer access to a very valuable audience. BuzzFeed: This site has a great HTML-based (i.e., non-PDF) media kit. 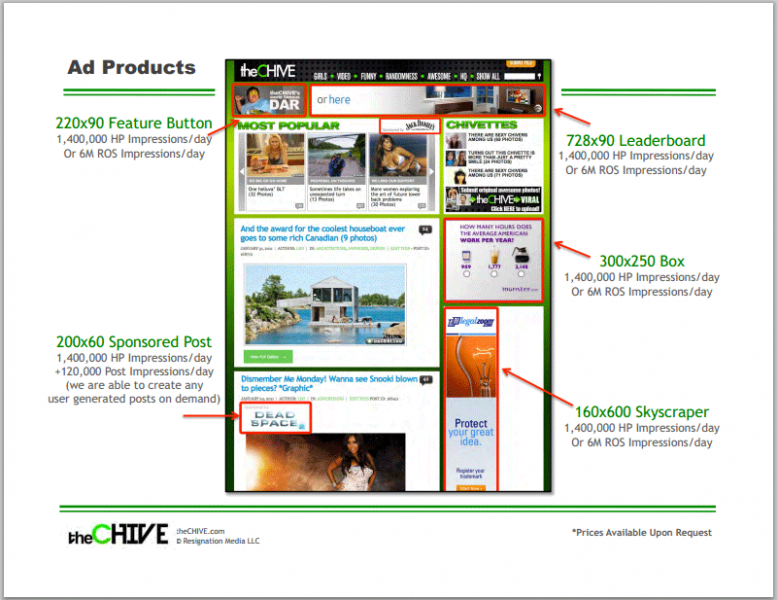 There’s a boatload of data to quantify the audience as well as detailed specs about the advertising options available. DailyCandy.com: This kit includes very clean displays of the advertising opportunities available, via both email and DailyCandy.com. Elle: There’s way too much real estate devoted to profiles of contributors (this media kit feels like it was an exercise in ego stroking), but the “Beyond the Demographics” page is a nice example of compelling audience profiles. The Nation: The presentation of this media kit is terrible, but the “Audience Profile”” is a good example of using both basic demographic stats and more precise profiles to paint a picture of who visits the site. National Review: This one isn’t the prettiest media kit we’ve seen, but the efficiency is impressive. The ad layout page is solid, and the audience demographics page could be killer if it was given a bit of a makeover. Weekly Standard: If you can make it through the extensive profiles of contributors, there are a couple elements of this media kit worth borrowing. The three pages of testimonials at the end give a good endorsement of the publication’s quality (though one page would probably be sufficient). WomensHealthMag.com: Here’s an example of a one-page media kit. This is probably a bit too brief–there’s plenty of information that’s missing–but it is a good template of a media kit that can do in a pinch. WestchesterMagazine.com: This one is pretty bad, but the last page has a good example of a clean layout of ad units. Thanks for this resource and the example.